With the following remarks by Professor Kruskal and Mr. Juergens we conclude the exchange which was begun in the winter, 1973, issue. The paper which initially sparked this discussion was Juergens' "Reconciling Celestial Mechanics and Velikovskian Catastrophism," published in the fall, 1972, Pensée. Ed. "Consider a solar system with all bodies charged in proportion to their masses, so that the real masses are partially concealed by a measure of electrical repulsion counteracting gravitational attraction. No matter how the planets in such a system orbit in and out of conjunction configurations, the sun's gravitational pull on each of them is unaffected. But what of the repulsive forces? It seems to me that any electric-field lines ordinarily stretching between the sun and the earth, for example, are going to be distorted, if not short-circuited, each time Mercury or Venus orbits between the sun and the earth." Now really! Electric field lines are a graphic and often useful visualization of an electrostatic field, but they are not ingredients of the basic theory. The inverse square law for the force between two elements of charge is basic, and it applies whether or not other charged bodies occupy the space between the elements. And, in fact, there is no difference between the electrostatic and gravitational forces in this respect. One can also visualize gravitational lines of force, and can get oneself very confused worrying about distortions of these lines during conjunctions, if one insists on trying to understand classical celestial mechanics on that basis. "Suppose the interplanetary plasma in the vicinity of the earth has electric potential V1. Suppose also that the earth's total electric charge Q is such that Q = Q1 + Q2, where Q1 alone would invest the earth with potential V1." He then goes on to accuse me of assuming implicitly and unjustifiably that Q1 = 0. And I did assume, or rather deduce, that Q1 = 0, and it is Juergens' failure to do so, his willingness to countenance Q1 ¹ 0, which is precisely his egregious error, the one I was trying to call attention to. Juergens' confusion here is reminiscent of the confusion in pre-Newtonian dynamics, when it was believed that a steady force was needed in order for a mass particle to maintain a velocity, rather than as we now understand to maintain an acceleration (i.e. to change its velocity). "A body absolutely devoid of net electric charge may be considered to have a surface electric potential of absolute zero." Well, yes, as long as only one such body at a time is considered. But if so fundamental a concept were correct and significant, it should apply to two (or more) separate bodies each absolutely devoid of charge—and you just can't (in general) simultaneously assume that both of them have zero surface potential, since there may be a potential difference between them. "On basic principles, one would expect that every magnetic line of force directly related to the sun would have to form a closed curve between two points on the surface of the sun." This is flatly wrong. For instance, the familiar dipole field commonly associated with a bar magnet has a magnetic line of force leaving each pole directly away from the other pole and going off to infinity. Such behavior is in fact not only typical but even general: it is a mathematical (topological) theorem that, under reasonable conditions, for every magnetic field configuration in space with lines leaving and entering a sphere (say) there is some point on the sphere the line through which never returns to the sphere. Juergens answers point (5) together with point (8), and he distorts the sense of point (6) without falling into demonstrable error, so I'll pass over these without comment. Up to this point I have felt that Mr. Juergens, no matter how misguided, was at least trying to take my comments seriously. However, his dismissal of point (7) as humorous but irrelevant, without any response whatsoever, leaves unanswered a seriously meant if humorously couched criticism. Any irrelevance was his for quoting Sanford in the first place if he did not put stock in the quote, if it had no place in his line of thought, why did he include it? Answer to point (8); here we go again! "But if the sun finds itself, as I [Juergens] suggest, in an environment whose electric potential is strongly negative (below absolute zero of potential), it will be induced to take on negative charge to reduce its intrinsic potential." I can't hash this out all over again, but the sentence just doesn't make sense for reasons I explained in connection with point (2) above as clearly as I'm able. "Kruskal seems to be saying that charge in the outer atmosphere could not produce this field [in the lower atmosphere], and this seems to leave only charge on the body of the earth to be held responsible for the atmospheric field. Yet he tells us that no amount of experimenting on earth can tell us whether or not the earth as a whole is charged." I am afraid this is disingenuous of you, Mr. Juergens! The "earth as a whole" includes the atmosphere as well as the body. Of course charge on "the body of the earth" can produce atmospheric field, and can be detected by experiments on earth. Read point (8) again. The answers to points (9), (10), and (11) don't seem to require discussion. Well, what am I to say in conclusion? The right thing for Mr. Juergens to do, after absorbing all this discussion, is to admit that he has fallen into many elementary errors through inadequate background in physics and that his astrophysical opinions don't deserve the attention of a serious reader. What are the chances of his doing the right thing? Very, very small, I am afraid. But the serious reader need examine only two or three of the issues raised to convince himself quickly of what I say. Am I being too harsh with Mr. Juergens? Possibly. But since he has seen fit to question the care with which I read his paper, let me in turn question the extent of his consideration of my comments. After all, I didn't criticize the subtler aspects of his theory. It quickly became so clear that the basic physics was erroneous that there was neither need nor point in doing so. Did Juergens discuss any of our disagreements on the basic physics with a trained physicist? Will he now, in fact? Professor Kruskal appears to believe that I am tilting at windmills in suggesting that the presence of a third charged body in the space between two other charged bodies will distort the local electrostatic field, and hence alter the play of electrostatic forces between the first two bodies. He insists that "the inverse square law for the force between two elements of charge is basic, and it applies whether or not other charged bodies occupy the space between the elements;" furthermore, "there is no difference between the electrostatic and gravitational forces in this respect." This is a remarkable stance to be taken by a scientist of Kruskal's stature. I concede that field lines are fictions invented to facilitate visualization of electrostatic fields and forces. But let me have recourse to them briefly to illustrate a basic point: Suppose the sun were a charged body in what used to be thought of as vacuous space; it would then be surrounded by an electric field reaching radially outward in all directions (or radially inward from all directions). Any material body, conductor or non-conductor-say, the earth-orbiting through that radial field will warp it, causing at least some (theoretically, all) lines of electric flux to be shifted from the positions they would have occupied were that body not present (1). It happens that an electrically neutral body in such a radial solar field will cause the field lines to crowd more closely together in its vicinity. Indeed, the body will have a greater density of electric flux on its sunlit side than on its dark side, which produces a net radial force tending to move it toward the sun, even though it carries no charge of its own. Were the body itself to be electrically charged, either positively or negatively, the distortion of the field would be different from that due to a neutral body, but distortion there would be, and net forces there would be except under the most arbitrary or fortuitous circumstances of charge distribution. And with field distortion of even the slightest amount, the inverse-square law becomes invalid. When this situation is compounded by the presence of additional orbiting bodies—planets, satellites, comets, meteoroids, dust clouds the problem quickly grows beyond the limits of mathematical analysis. So I contend, still, that the system of like-charged bodies proposed by Kruskal in his initial review of my paper would not operate exactly in the manner he believes—and Coulomb's Law might suggest—it would. I am not totally ignorant of an exercise in mathematical logic that demonstrates quite convincingly that Coulomb's Law is necessarily an inverse-square law (2). I do argue, however, that Coulomb's law is applicable, in the strictest sense, only to forces between two immaterial point charges— not to charged material bodies, and particularly when the field between them is distorted by the presence of additional charged bodies. This difference of opinion is entirely an academic question, as I noted in the earlier exchange with Kruskal (3), since the solar system does not operate in a dielectric void, but in space pervaded by electrically conducting plasma. Professor Kruskal chooses not to address himself to this point—the first premise of my Pensée article—or to my argument that the plasma in space must prevent electrostatic forces from reaching across interplanetary distances. Kruskal calls it an "egregious error" on my part that I show a "willingness to countenance" the idea that the earth, to have a non-zero electric potential, must actually carry electric charge. As he sees it, "if the vicinity of a body is at potential V1 , and the body has no charge anywhere, then the body must be at that same potential." Since he and I continue to find ourselves at loggerheads over this point, let me attempt to resolve it by appeal to authority. "A plasma does not necessarily possess an intrinsic electric potential. Where plasmas form in electrical discharges, however—and this is the connection in which Langmuir studied them—they do acquire non-zero potentials." A plasma at non-zero potential must be electrified by the presence of excess electric charges of one sign or the other, and this at first seems contradictory; physicists today tend to think of a plasma as made up of absolutely equal numbers of positive and negative particles. Langmuir, however, who coined the term "plasma," fully understood that only quasi-neutrality prevails in the plasma regions of electrical discharges (4). Plasmas are electrically "neutral" only by comparison with sheaths, which are characterized by strong space charge. ". . . From 1923 to 1929, Langmuir and co-workers Mott-Smith, Blodgett, and Tonks, developed the theory of electrical discharges with space charge. The first thing they did was to develop the Langmuir probe ... Just as a hot wire [emitting electrons in a vacuum tube] is separated from any collecting surface by a space-charge region, so Langmuir pictured the discharge to be separated from ... probes by a space-charge sheath. Everyone before Langmuir who introduced wires into discharges thought that he measured the voltage at that point in space. It generally turned out to be strongly negative [with respect to the potential of the non-conducting vessel walls]. By adopting a picture in which the discharge is separated from all material objects by a sheath, Langmuir was able to distinguish 'floating potential' [— that of the probe or other material body in contact with the plasma —] from 'space potential' [— plasma potential —] to show that the space potential, far from being negative, was usually positive, relative to the walls . . ."
So, if I may be permitted to interpret Dr. Kruskal's word, "vicinity," to mean the surrounding plasma in the case of a cosmic body, I think it fair to insist that the electric potential of a planet immersed in the interplanetary plasma will be, at the very least, a "floating potential," distinguishable from—that is, unequal to—the "space potential" of that plasma. Dr. Kruskal agrees that one body "absolutely devoid of net electric charge may be considered to have a surface electric potential of absolute zero," but he resists the argument that another body in the very same condition must be at the same (non) potential as the first. Surely he cannot mean what he says. Next we come to his reference to a topological theorem that allows certain precisely located, hypothetical, magnetic lines of force to proceed radially out of the poles of a magnetized sphere, never to bend around and return. With such a theorem, I have no quarrel. But mathematics, as Kruskal, I think, would agree, frequently leads one to conclusions which have no physical reality. My point is that no one has yet been able to demonstrate that magnetism can be unrelated to electric currents. The only current that could conceivably produce the open-ended types of magnetic-flux lines insisted upon by Kruskal would be a ring current circling the sun at an infinite distance. Probably no one—least of all, perhaps, Dr. Kruskal wants to countenance such a heliocentric view of the universe. I am afraid I still see Kruskal's paraphrasing of Sanford as a non-sequitur. He, however, remains pleased with the "device," and that is certainly his privilege. Although I cannot accept them, I believe Professor Kruskal is quite sincere in his criticisms. I suggest, however, that some of the elementary theory he seeks to marshall against me is irrelevant in the context of electrical-discharge phenomena. I urge him to heed the ten-year-old advice of a fellow scientist, E. U. Condon: "It would probably save vast sums of money [and much debate over elementary theory?] if most of the men now working on plasmas in government contract laboratories would stop and devote a few months to the careful study of Langmuir's papers [on Thermionic Phenomena, Electrical Discharge, and Plasma and Oscillations, Vols. 3, 4, and 5, respectively, of The Collected Works of Irving Langmuir (Pergamon) 1961-621 " (6). (II-1) See, for example, an article on "Electrostatics" by A. D. Moore, Scientific American (March 1972), pp. 47-58. (II-2) See L. B. Loeb, Fundamentals of Electricity and Magnetism, 3rd ed., (1947), Dover (1961), p. 178. (II-3) Pensée (Winter, 1973), 53. (II-4) As just one example, see Vol. 4 of Langmuir's Collected Works, p. 193: ". . . two distinct types of regions appear within the discharge. The region ... within which electrons are trapped until [electron and positive-ion concentrations) are nearly equal, will be referred to as the plasma . . ." Similar definitions of "plasma" are found throughout Langmuir's papers on electrical discharges. (II-5) Physics Today (December, 1962), 23-26. (II-6) "Langmuir's Work: Physics, Chemistry, and Engineering, Intimately Intertwined," a book review in Science, 138 (October 12, 1962), 126-27. In a letter to Dr. Lining of Charles Town, South Carolina, addressed and dated Philadelphia, March 18, 1755, Benjamin Franklin reproduced the section of the Minutes he kept which described the steps in his arriving at the conclusion that lightning is but a glorified electric spark. It was an even more striking similarity between a characteristic of the lightning discharge and of a solar phenomenon which suggested to me a step of even greater ratio in the extension of the field of electrical discharges in gases. I should like to refer to it and to the identity between some other laws governing the two sets of phenomena which in the ensuing 32 years I have succeeded in recognizing. The first identity—between the velocities of propagation of a solar prominence and an electrical discharge—was brought to my notice during Sydney Chapman's Kelvin Lecture on "The Sun" to the Institution of Electrical Engineers on 9 May 1941. He reported that John Evershed had photographed a solar prominence that had reached a height of a million miles in an hour. I thought, "If that isn't about 3 x 107 cm sec-1, I'll eat my hat." It was, as a little mental arithmetic, confirmed on an envelope when the lights went up, established—and I was in business as an astrophysicist. It seemed extremely unlikely that these two velocities could be so nearly identical and yet derive from entirely different physical processes. Admittedly the density of the solar atmosphere is very much less than that of the terrestrial atmosphere, but I knew that the velocity of propagation of an electrical discharge is independent of the gas density. The most direct and obvious comparison is between their relative physical dimensions. It is difficult to understand how anyone could look at Evershed's photograph of that solar prominence and not immediately conclude that it is an electrical discharge. The extreme thinness of these solar phenomena had been commented on over the years. Baade and Minkowski photographed one of these long, thin astrophysical discharges actually being propagated. on a galactic scale in Galaxy NGC 4486, the well-known, so-called "jet" in the radio source Virgo A. But many of such old discharge channels are seen in the photographs of every spiral-or irregular-galaxy. This characteristic of both astrophysical phenomena and electrical discharges is so well known as to call for little comment. However, one may recall the existence of Pettit's so-called "coronals," which first appear high above the Sun's "surface." In 1946 I pointed out that they show the leader-return stroke mechanism observed in downward lightning flashes from thunderclouds to earth (Observatory, 66, 1946, 263). In 1946 Pettit pointed out that one solar prominence exerted an attractive force on another 260,000 km away, as would parallel electrical discharges. As was noted earlier (J. Franklin Institute, 272, 1961, 449), the same effect will be seen to account on a much greater scale for the interaction between Galaxies NGC 3187 and NGC 3190, which is entirely different from any effect to be expected from gravitational interactions. A lightning flash radiates an atmospheric , the form and magnitude of which I had first calculated in 1941, immediately prior to attending that Kelvin Lecture. Similarly, a solar flare radiates the "crochets"  recorded in the Earth's magnetic field, the forms of which I recognized as similar to those of terrestrial atmospherics, but with a time scale of minutes instead of microseconds. Applying the same theory developed for the latter, and reversing the process, I calculated the current in a solar flare to be 1014 amp (Observatory, 69, 1949, 110). This gave magnetic fields in the flare itself of 104 to 105 gauss and expected Hα line widths of 0.8 to 8A . Those observed by Ellison about the same time were 1 to 16 A, in good agreement with these theoretical values. Similar but much greater broadening [of spectral lines] was then found in the initial stages of a nova, or new-star, outburst. The line-broadening was definitely governed by the λ2 law of the Zeeman Effect, and not, as was generally supposed, by the λ-law of the Doppler Effect (Observatory, 69, 1949, 193). It was pointed out to me by Dr. Hunter of Greenwich Observatory, then Editor of the Observatory, that the λ2-law of line-broadening had already been discovered in spectra of an earlier nova by Wright of Lick Observatory . These two phenomena—solar flares and novae—likewise show current waves  similar to that of the lightning flash, which I had also calculated for the first time in the earlier studies of the lightning discharge, because of its interest to electrical engineers. When radio galaxies were discovered, I realized they are those galaxies in which the radial electric fields in their atmospheres are breaking down in discharges which ultimately form the spiral-or irregular-arms. They should therefore show a similar current-wave form. Until quasars were discovered, the absence of galaxies which are radiating an inordinate amount of energy—corresponding to the "naked-eye" phase of novae—presented one of the theory's major difficulties. However, in a paper to the Second U.S.A.F. Conference on Atmospheric Electricity in 1958, I not only pointed out the existence of this peak-current—or quasar, as it was later to be called—phase of a radio galaxy's life, but also gave a rough estimate of its duration as "possibly millions of years." Quasars were finally discovered in 1962, and by 1966 Maarten Schmidt was able to estimate their lifetimes as 106 to 107 years, or "possibly millions of years." That law of electrical discharges which has been of the greatest importance in cosmic atmospheric electrical discharges, and, as I had written to Ralph Juergens in 1965, has shaped the universe, is their property of aggregating atmospheric matter along the discharge channel, whether the discharge is the ignition spark of a car, the welding arc, or a spiral arm of a galaxy. When it operates, as it does whenever electrical breakdown occurs, one can forget about the force of gravitation, as every arc welder knows. This law was probably first brought to the notice of electrical engineers in a paper by Bellaschi of the American Westinghouse Company in 1937. His colleague R. C. Mason had shown that in an electrical discharge the conducting particles, ions and electrons, are caused by their movement in the discharge's own magnetic field to move inwards towards its axis, taking the gas atoms with them. This gives rise to an axial increase in pressure, p, which is proportional to the product of the current, I, and the current density, i: p=kIi. Bellaschi showed that this effect can cause pressures of over 50 atmospheres in a lightning flash. The most direct confirmation of this law in astrophysics was the observation by Jefferies and Orrall of this axial pressure rise in a solar prominence when, in 1966, they set the slit of their spectrograph across the discharge and were able to deduce that the pressure at the axis was ten times the pressure 20,000 km out. We see the results of the operation of this law in the twin arms of planetary nebulae—the existence of which was a successful prediction of the theory, and the confirmation of which proved quite difficult, since no one seemed to know of their existence—and of spiral galaxies. On a still grander scale, the universal discharge had aggregated the matter of the universal atmosphere to allow for the formation of the long "clouds" of galaxies discovered some years ago at Harvard Observatory. Maecker pointed out in 1955 that variation in either I or i will give rise to a variation in the axial pressure rise, and hence to a flow of gas, and thus explained for the first time the cause of the anode and cathode jets of the electric arc, which had been the subject of so much fruitless discussion over the years. As both I and i will decrease outwards in atmospheric electrical discharges, all will thus give rise to gas jets. We see the result in the solar wind and in quasars. I earlier pointed out that Shklovsky greatly improved his earlier hypothetical explanation of radio galaxies by adding to his two earlier postulates of relativistic electrons and magnetic fields a third characteristic of thermonuclear electrical discharges, a gas jet, and calling the result a "magnetoid." This characteristic of electrical discharges led to some of the new theory's most "uncomfortable:' but most surprisingly successful predictions: (1) that the temperature in solar flares must reach hundreds of millions of degrees; (2) that the gas velocities in the Evershed Effect (6) should reach 8 km sec-1, despite over 50 years of measurements of these velocities reaching only 1 to 2 km sec-1. Neither of these predictions had long to wait for observational confirmation (See Nature, 187, 1960, 865 and J. Franklin Institute, 276, 1963, 407). A new theory of ball lightning (J. I. E. E., 9, 1964, 357; Nature, 202, 1964, 996)—that it results from the escape of hot gas from "holes" in the magnetic "hose pipe" at every sudden bend in every electrical discharge—was shown to lead to reasonable values for the size of the balls and for their energy content. It also led to a successful prediction as to where such luminous balls should be looked for in Boys-Camera or "streak" photographs  of lightning and long spark discharges. Such a ball of luminous gas of long duration was also found to be generated at every one of the "crinkles" in flashovers of insulator strings, as my then Electrical Research Association colleague, Ouyang, pointed out to me when the theory was first published. When I pointed out to Roger Hayward of Pasadena that this effect is entirely independent of scale, and that therefore such balls of gas are to be expected at every markedly sudden bend in the spiral arms of galaxies, he wrote to draw my attention to photographs of barred-spiral galaxies in Sandage's Hubble Atlas of Galaxies. Many of these reduce to three balls: the nucleus, plus a ball of gas which has escaped at each sudden bend at the ends of the two bars. It was shown (J. I. E. E., 9, 474, 1963) that the same effect will explain what had, since Abney's original suggestion in 1879, been regarded as due to stellar rotation  . It is not the star as a whole which is rotating, but vortex balls of hot gas, each rotating at a velocity governed by its temperature. The variation of the rotational velocity with the temperature of the gas, and hence the energy level of the lines observed to be broadened, was found to be that predicted by the theory, but had completely baffled Huang and Struve (Stellar Atmospheres, J. L. Greenstein, ed., Chicago University Press, 1960, p. 360). Several novae have been observed in which the outburst has been virtually extinguished around maximum brightness. On the electrical discharge theory this could only result from the extinction of the discharge as a result of the high pressure generated by it. The appearance in Nature of a photograph of a lightning flash which was pinched in several places near the ground, where the current in it is a maximum, suggested that the same phenomenon can occur in lightning, and that therefore lightning current waves will occur bearing a similarity to the light curves in these novae. These were looked for and found in the highest current wave so far recorded, that of Berger and Wogelsanger (Electronics & Power, 12, 1966, 200; Nature, 211, 1966, 62). I have left to the end the most direct proof of the identity of astrophysical phenomena and electrical discharges, involving what must be one of the most important astronomical observations ever made. In a letter to me in January 1968, Dr. A. B. Severny, Head of the Astrophysical Observatory of the Crimea, whose techniques for the measurement of solar "surface" magnetic fields are unsurpassed, informed me that he had examined the magnetic fields surrounding two solar flares in 1966 and had found them to be such as would surround the flares if they are electrical discharges. These and other identical characteristics of astrophysical phenomena and electrical discharges have been described in well over 100 contributions to the scientific and technical press since the first outline of the theory was published in 1944 (A New Approach in Astrophysics and Cosmogony, private publication). As these include Nature, Observatory, Philosophical Magazine, Journal of the Franklin Institute, comptes Rendus (Paris), Journal of the Institution of Electrical Engineers (later Electronics & Power), as well as contributions to the proceedings of international conferences, the almost complete "ignoration" of the theory by astrophysicists over all these years must seem surprising, to say the least. It all becomes even more difficult to comprehend when one considers their many confessions of complete bafflement. For example, Hoyle recently concluded in his George Darwin Lecture to the Royal Astronomical Society that "changes in the laws of physics" will be required to get them out of their difficulties. Kahn, who has written a book and much besides on quasars, recently summed up the results of six years of the most intensive observational and theoretical investigation ever devoted to one set of heavenly bodies: "We shall not be able to claim that we understand the Universe until we know where they are, what they are, and how they function." Atmospherics, also referred to as "spherics," "sferics," and "radio-static," consist of invisible electromagnetic radiation from lightning discharges. Most of the energy in the very low frequency (VLF) band of the radio spectrum is due to lightning (Kenneth Davies, Ionospheric Radio Propagation, Dover Publications, 1966, p. 413). In referring here to "an atmospheric," Bruce seems to be speaking of the profile of a graph in which the intensity of radiation is plotted against time. A crochet is a small trace movement on the chart of a geomagnetic-field recording instrument. It is always simultaneous with the appearance of an intense solar flare and must therefore be due to an influence propagated at the speed of light. "The brightness or intensity of a flare is, in effect, the difference in brightness level between the peak of emission of the [spectral line under observation] and the continuous spectrum. The Hα line, as with other lines, in the spectrum of an undisturbed part of the chromosphere, has a dark central core of absorption ... and a gradation of less absorption on either side of it, known as the 'wings' of the line . . . When a flare occurs, this dark core becomes partly or completely reversed, so that what was previously absorption now becomes emission that may rise above the level of the continuous spectrum. . . [and] it is possible to measure [this increase] . . . Another index of flare magnitude, not requiring measures of light intensities, is given by measuring in angstrom units the range. . over which the flare emission extends to the wings of Ha. . . In a flare of great intensity on 25 July 1946, the effective line-width observed by Ellison was 20 angstrom units" (H. W. Newton, The Face of the Sun, Penguin Books, 1958, pp. 108-109). Bruce is suggesting here that the line-broadening associated with solar flares is a Zeeman Effect (see Footnote 4, below). This follows from his reference to a calculation of the flare magnetic-field values and from the next paragraph, which he starts with the words: "Similar but much greater broadening. . ."
 Spectral line-broadening due to random motions in the gas emitting the line (Doppler Effect) is proportional to the wavelength (X) of the radiation in question. Line-broadening due to the presence of a magnetic field (Zeeman Effect) is proportional to the square of the wavelength. "Current wave" refers to the typical current/time characteristic of the discharge, in which the current rapidly reaches a peak value and then diminishes more slowly, the graph forming a long tail. 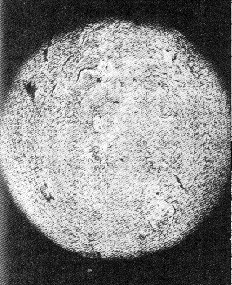 In 1909 Evershed, attempting to measure vortical motion from Doppler displacements of spectral lines of iron in sunspots close to the solar limb, failed. But his findings were consistent with a radial outflow of gases from sunspots, which was therefore named the Evershed Effect. Details were added to the picture over the years-including Abetti's discovery that vortical motion is indeed present, as visual observation had suggested to Hale long before—but most observers reported velocities of flow of only about 2 km sec-1 or less. Bruce's theory, however, required gas velocities in the Evershed Effect to be that of sound in atomic hydrogen at the temperature of the photosphere, i.e., about 7 km sec-1. In 1961, Severny reported that careful studies of the fine structure in the Evershed Effect had yielded velocities up to 8 km sec-1. The Boys Camera is a specialized photographic device with two lenses. A central lens takes an ordinary "time-exposure" photograph of a lightning stroke, while an off-center satellite lens rotates around the central axis and "smears" a similar picture around the central image to show the development of the discharge with passing time. The complete record is thus captured on a single sheet of film. Bruce here refers to very broad absorption lines in the spectra of certain stars. An example given by Bruce in the cited reference is the star Gamma Cassiopeia, in which "the higher the temperature or the lower the pressure [as inferred from the excitation levels of different spectral lines], the greater is the line broadening . . . Since it is difficult to suppose that there is a correlation between stellar rotation and surface temperature and pressure, we again conclude that the observed line widths. . . are not due to rotation. "—Thus Bruce quotes Huang and Struve. The discussion concerning electrical discharges on celestial bodies is of particular interest to me for two reasons. One is that I support the views of Dr. C. E. R. Bruce (1) on cosmic electrical discharges, and the other is that my explanation of atmospheric charging (2) is applicable to all massive radiant bodies. "The theory falls into four major parts: 1) The building-up of cosmic atmospheric electric fields; 2) The breakdown of these fields in electric discharges; 3) The gathering of atmospheric matter along the discharge channels; 4) The production of jets of hot gas as a result of the preceding processes." He then went on to say ". . . Bruce is probably right in advocating that if the first step can be accomplished the others will follow more or less automatically." I would like to amplify briefly some important aspects of Bruce's theory before returning to the question of charging. Electrical atmospheric discharges similar to lightning produce a magnetic field which compresses the channel of the current. When this occurs in a prolonged discharge in astronomy it causes aggregation of large volumes of thinly distributed gas and matter into relatively narrow channels, so that when the current dies away the compressed gas expands and cools, condensing into stars in galactic atmospheres and either planets or companion stars in stellar atmospheres. The comments of Professor G. Burbidge on cosmic evolution (5) may be of interest at this point. He writes ". . . attempts are made to explain the condensation of dense objects from an initial cloud of matter and radiation which is expanding. It has been known for many years that this is very difficult to understand, and the investigations have now reached the point where it is generally accepted that the existence of dense objects cannot be understood unless very large density fluctuations in a highly turbulent medium, or otherwise, are invoked in the first place. There is again no physical understanding of the situation . . ." It seems quite clear that Bruce's theory offers a reasonable explanation for these difficulties and it is surprising that Burbidge has apparently failed to realize the significance of the electrical discharging process. When prolonged discharges occur, a jet is formed by the acceleration of the relatively heavy positive ions in the electric field and by the pressure gradient in the channel caused by the widening of its cross section and the change in the value of the main flow of current due to lateral discharges. This jet attains the speed of sound in the medium and continues to extend into the atmosphere as long as the discharge persists, that is until the voltage gradient falls below the level which will maintain the current; a much smaller value than that required to start the discharge. Magnetic pinch effects and rapid fluctuations of energy output are also observed. The jet follows the highly conducting ionized path, taking the high voltage of the nucleus far out into the oppositely charged atmosphere, where much of the stored energy is collected and consumed by the lateral discharges. Such jets are clearly visible in quasars, where they are starting the formation of galactic arms in Hubble type SO galaxies, following a period of steady charging for some hundreds of millions of years as elliptical type EO - E7 galaxies. A diametrically opposite jet forms, either by the effect of galactic rotation, as Bruce claims, or because of the gravitational, electrical or magnetic influence of adjacent galaxies and their discharges. It is perhaps significant that some jets are seen to point towards nearby galaxies (6). These jets extend rapidly for a few million years of peak energy output, as thermonuclear discharges, into the charged atmosphere, many thousands of light years in extent, the high positive voltage of the jets attracting the surrounding negative particles and free electrons. The latter reach relativistic velocities, producing radio emission from extensive lobes at zones opposite the central nucleus. The nuclear reactions in the channels synthesize heavy elements and are later observed in Population I stars, while the older Population II stars which are formed by gravitational aggregation of matter outside the galactic arms have a lower content of these elements. Other jets are seen in planetary nebulae, where many examples of spiral arms and other shapes similar to those in galaxies (except for those with four jets at right angles) have been photographed, as well as the more publicized "ring" type, indicating that this is most likely a jet viewed end-on. Bruce has described in some detail with considerable supporting evidence how stars evolve through novae and planetary nebulae stages, in which condensations in the discharge arms form planets and companion stars of binary systems. (7) He has also shown how variable stars are explained by charge-discharge processes in their extensive atmospheres. Jets in the atmosphere of the Sun at various levels are evidently caused by the same electrical discharge process and produce the observed high gas temperatures and velocities. Many of the characteristics of solar disturbances are very similar to those of lightning, but this cannot be properly appreciated if the phenomena of lightning is not understood. The evidence in support of electrical discharging seems to me to be so overwhelming that there must be a rational explanation for charging. Bruce explains this (8) in terms of meteorological processes similar to those in the earth's atmosphere which produce lightning, with the addition of the effects of the powerful jets which occur once the discharges are established. This process seems too random for the extensive charging which must occur and the lack of satisfactory explanation may be one of the main reasons why Bruce's theory has failed to be accepted in its 30 years of struggle for recognition. I consider that the important factor in charging is that radiation from a star or the nucleus of a galaxy exerts a force of repulsion opposing the gravitational force on particles in its atmosphere. This is a very small force indeed, but it can operate for an indefinite time in the same outward direction. Consequently if a particle is just light enough to be repelled by the radiation pressure, which has a greater effect on small particles, it will continue to accelerate outwards and may attain a very high velocity unless acted on by other forces (9). Both radiation pressure and gravitational force are inversely proportional to the square of the distance from the centre of the radiant body, so the resultant force will act in a constant direction and either precipitate or eject the particle, once it is formed, unless its mass changes by aggregation or splitting, or it is acted on by electrical and magnetic forces. In the case of the Sun, I estimate the radiation pressure near the "surface" as 4.2 dynes cm-2 and the gravitational force is 27 times that at the earth's surface. A spherical particle of radius 0.4 gm and density 3 gm cm-3 will just be in equilibrium, smaller ones being ejected and larger precipitated. In fact particles of this density and average radius of 0.3 µm considered to be of solar origin have been collected by rockets and satellites (10). These particles must act rather like ice grains in the earth's atmosphere and become charged by glancing collisions and other processes. In effect there are continual storms on the Sun and other stars, in which metallic hail forms when the temperature drops to about 3500K-4000K, some of which is precipitated and is then evaporated by the heat from below, thus continuing the meteorological cycle. The smaller particles are most likely to be predominantly negative, and when these are ejected they will produce an increasing negative atmospheric charge, while the larger predominantly positive particles charge the solar surface. An atmospheric voltage gradient is set up in this way, and a small leakage current will flow at first, because hydrogen gas at about 4000K is a good insulator. The increasing voltage gradient will tend to pull the negatively charged particles inwards, and only the particles of very small size and charge will continue to escape. Eventually the energy of the electrons in the discharge current will be high enough to cause cascade ionization and many catastrophic discharges will occur, increasing the average temperature of the photospheric zone to 6000K. These discharges form continually in times of minutes all over the solar surface, the arcs being visible as white granulation patches and streaks in the perimeter of sunspots (11). Magnetic fields and other evidence fully support this view. Charged particles ejected to greater distances beyond the photosphere take longer to accumulate to breakdown voltage, and the resultant discharges are more violent and sporadic. These prominences and solar flares exert powerful magnetic forces and neutralize areas of photospheric discharges, producing sunspots and revealing the true "surface" of the Sun at 4000K. It is therefore unnecessary to postulate internal magnetic forces of unknown origin which appear unpredictably from the solar interior. The charging process is accelerated by the action of discharge generated jets, but where these have been obliterated in the inner part of sunspots, it can take many days or weeks to re-establish the photospheric charges by the slower radiation pressure process. In the previous issue of Pensée, Ralph Juergens suggested that solar heat may not arise from internal nuclear reactions, but I do not think he has a very strong case and it is unnecessary if Bruce's theory is correct. There is a very convincing explanation of the nuclear processes in "Evolution of the Galaxies" by Vincent C. Reddish (12), who was the visiting professor of the American Astronomical Society, Warner and Swasey Observatory, Cleveland, Ohio, in 1966. However, the external temperature due to the nuclear reactions is about 4000K, not 6000K as he assumes, which probably explains the low neutrino count (13). Astronomers have commented on two other objections to Bruce's theory, which I will mention briefly. One is that in extremely rarified galactic atmospheres, the electrical conductivity is very high even at low temperatures. An electrical gradient will produce a discharge current, but when all the free ions are in motion, the voltage gradient can continue to increase by the movement of charged solid particles without a corresponding increase of the discharging current. However, the energy of the free electrons moving towards the positive nucleus will increase until they cause cascade ionization at the breakdown level. This is the Townsend gas discharge characteristic, and it enables a vast amount of energy to accumulate as widely dispersed atmospheric charge before the conditions are ripe for its release into concentrated discharge channels. A complete vacuum is a perfect insulator, so the objection on the grounds of high conductivity is not very convincing. The other objection is that the theory has not been explained in detailed mathematical terms. Bruce has, in fact, listed many calculated values, such as voltage gradients (14), temperatures, velocities, and so on, many being accurate predictions. Established theories have evolved from the work of generations of astronomers, and it is a little unreasonable to expect Bruce and a few supporters of the electrical discharge theory to have achieved comparable results. Much more work needs to be done, and I hope some person or organization of influence will note this and decide to encourage further investigations, especially as Dr. Bruce is now aged 71 and hopefully will receive recognition for his work in astrophysics. This may seem some way from the subject of Velikovsky, but it is impossible to guess where a new scientific development will lead. It seems an obvious step at present to follow up the ideas on electrical charging and discharging processes, which may illuminate the views of Velikovsky in quite unexpected ways. (IV-1) C. E. R. Bruce, Pensée (Winter, 1973), 53; (and this issue). (IV-2) E. W. Crew, "Electronics and Power," Journal I. E. E. (Nov., 1972), 426. (IV-3) List issued by Electrical Research Association, Leatherhead, Surrey, England. (IV-4) E. Tandberg-Hanssen, "Solar Activity" (Blaisdell, 1967), p. 302. (IV-6) G. R. and E. M. Burbidge "Quasi-stellar Objects—A Progress Report," Nature, 224 (Oct. 4, 1969), 21, fig. 2. (IV-7) Electrical Research Association Report 5275, 1968. (IV-8) C. E. R. Bruce, Philosophical Magazine (Sept., 1955), 1123. (IV-9) P. D. Noerdlinger, "Radiation Pressure on Test Particle," Nature, 237 (1972), 30. (IV-10) C. L. Hemenway, D. S. Hallgren and D. C. Schmalberger, "Stardust," Nature, 238 (Aug. 4, 1972), 256. (IV-11) E. W. Crew, "Solar Electrical Discharges,"Nature, 241 (Jan. 5, 1973), 39. (IV-12) Published in U.K. by Oliver and Boyd. (IV-13) R. Stothers and D. Ezer, Astrophysical Letters, 13 (1973), 45. (IV-14) "Problems of Atmospheric and Space Electricity," ed. S. C. Coroniti, (Elsevier Publishing Co., 1965), p. 579. This rather extended exchange in the pages of Pensée appears to have drifted considerably from the primary subject of my paper on "Reconciling Celestial Mechanics and Velikovskian Catastrophism." And this, of course, is my "fault," for I found it necessary not only to ascribe electrical shielding to the interplanetary plasma but to seek a reason why that plasma is there in the first place. Of fundamental significance is the fact that the solar corona is ionized not only in the immediate vicinity of the sun, but far out among the planets as well. A continuous supply of energy is required to maintain such a plasma. The obvious place to look for a source of energy is the sun, but when we do this, it is not so easy to find a suitable means of energy transport. Most workers today assume, in an offhand way, that solar ultraviolet and X-radiations are responsible for ionizing the gases in space, and much time and money are still being expended in attempts to detect and measure this radiation with instruments carried into outer space. But Alfvén once suggested, in connection with a theory of solar-system origins, that the interplanetary gas may have become ionized at an early period. His critics reminded him, however, that each of the then-conceivable causes of such ionization—solar radiation and atomic collisions—would be incapable of producing such an effect. Even magnesium, one of the easiest elements to ionize, could not be importantly excited at distances beyond the orbit of Mercury by solar radiations, and atomic collisions would be even less effective. The fact is, nevertheless, that the interplanetary medium is ionized, and it consists not of magnesium but largely of ionized hydrogen—an element considerably less susceptible to ionization. Moreover, the plasma may extend as far as the orbit of Jupiter (and possibly to the limits of the solar system). Proponents of ultraviolet ionization argue, quite reasonably, that the low density of the plasma is a factor in its preservation. But is this the entire story? Alfvén's rejoinder to his critics of an earlier day, who then were unprepared to accept the notion of ionized gas in space, was that electromagnetic effects like those associated with electrical discharges present ionizing possibilities far more effective than either radiation or atomic collisions. However, he offered no specific suggestion as to how electrical-discharge effects might be brought into play. Bruce's proposed electrical discharges in the lower atmosphere of the sun were conceived in a day when the presence of the interplanetary plasma and the solar wind were unknown. They offer an explanation for the heating of the corona, but I am not so sure they can do the same for the ionization of the interplanetary gases far out through the system. To my knowledge, Bruce never saw fit to predict such phenomena on the basis of his theory. The discharge I have postulated—between the sun and its galactic surroundings—would ensure the ionization of these gases by means of a continuous avalanche of electrons moving toward the sun with relativistic energies. And it would preserve ionization by accelerating positive ions. in the opposite direction, increasing their energies to a point where they would be true cosmic-ray particles when they left the system. Crew suggests an alternative explanation for charge separation in the solar atmosphere, one which may very well operate in the immediate vicinity of the sun and may even be of importance in producing galactic electrification. But, as with Bruce's suggestions, I feel it falls short on accounting for the preservation of ionization in the distant interplanetary plasma, particularly if, as seems inevitable, important space charges and the accompanying electric fields are built up, thus calling a halt to the process. • In spite of its rotation, the sun (the photosphere) is almost perfectly spherical (as pointed out long ago by Dr. Velikovsky). • The photosphere exhibits differential rotation, with the equatorial regions rotating faster than regions at higher latitudes, as if driven by the momentum of currents arriving along interplanetary magnetic-field lines. • The photosphere appears to be densely packed with plasma granules which behave like anode "tufts." • Negative hydrogen ions, characteristic of anode plasma in hydrogen-gas electrical discharges, are generally credited with producing the observed opacity of the photosphere. • Temperature increases with height in the chromosphere. • Associated magnetic effects indicate that plages and flares are electrical eruptions. • Spicules seem to have a transport function in some way related to photospheric granules. • The chromosphere-corona boundary is surprisingly sharp. • Ion temperatures in the corona run to several millions of degrees. • The coronal plasma pervades interplanetary space, to at least beyond the orbit of Mars. • Interplanetary magnetic fields show no relationship to a solar dipole field. • The coma of a comet contracts as the body approaches the sun. • Luminous envelopes (discharge striations?) often appear to expand outward from comet nuclei. • Comet tails elongate as the bodies approach the sun. • Venus, near inferior conjunction, shields the earth from solar protons, an effect totally incompatible with the "solar-wind" hypothesis. • Earth, near oppositions, influences the atmosphere of Mars (blue clearings), again contrary to "solar-wind" expectations. • Planetary configurations influence solar activity, as if the planets were exerting "grid" effects. • Solar flares are associated with disturbances in the earth's rotation, as if the earth, too, were being driven electrically. The theories of Bruce and Crew appear to make no accommodation for many phenomena indicating that the solar system at large is a complex electrodynamic entity. This is the primary reason for my own rejection of their treatment of electrical events on the sun. Kruskal has chosen not to involve himself with my comments about the ability of the interplanetary plasma to exclude electric fields and the associated forces. Dr. Velikovsky, however, asks, what about Pluto? "it behaves, or affects Uranus and Neptune, as if it has a substantial charge that is not shielded by the mechanism you describe." One prediction of the solar-discharge hypothesis would be that the interplanetary plasma region must give way, at some distance from the sun, to a region in which the "cathode drop" in potential between the sun and interstellar space is accomplished. At this stage in the inquiry, one can put numbers to these matters only by making entirely arbitrary assumptions, and I will refrain from doing so. But it does not seem implausible to suppose that the plasma region ends even this side of Jupiter, and I would expect the Pioneer probes reaching that vicinity to find that the thermal electrons are much less in evidence there and that the positive ions are being accelerated, as if into a cathode drop region. One question that immediately demands an answer when one thinks of the furor caused by Velikovsky's suggestion that electrical fields and forces must have a place in cosmic physics is this: Why are astronomers and astrophysicists so loath to receive such an idea? As Bruce has shown time and again, known phenomena associated with electrical discharges offer striking parallels for almost every observable feature of the sun and for inferred features of other stars, as well as of the galaxy itself. Why, then, has the professional community refused to pursue his suggestions? The answer, it seems to me, is this: Electricity and electrical discharges, for all their seeming promise in astrophysics, and notwithstanding the spectacular effects they are known to produce on earth - e.g., lightning and auroral displays—fail to qualify for consideration in cosmic affairs because the received view that stars are self-sufficient entities evolving in a passive environment seems to make the physics of electricity a superfluous luxury for theory building. A fundamental link in the chain of deduction is the known excellence of electrical conductivity in ionized gases—the stuff of the universe. In the Fall, 1972, issue of Pensée I quoted F. A. Lindemann's observation of half a century ago as to why the sun ought not retain any considerable electric charge— because its atmospheric gases are ionized. Menzel used Lindemann's argument against Velikovsky in 1952. And a few years later, even such a far-out thinker as Hannes Alfvén folded his tent and stole away in the face of the ionized gases. Alfvén at first expressed perplexity: "Nearly everything we know about the celestial universe has come from applying principles we have learned in terrestrial physics . . . Yet there is one great branch of physics which up to now has told us little or nothing about astronomy. That branch is electricity. It is rather astonishing that this phenomenon, which has been so exhaustively studied on the earth, has been of so little help in the celestial sphere . . ." (The New Astronomy, Simon & Schuster, 1955, p. 74). Yet this profession of astonishment had a hollow ring, for in an earlier work he took one look at the high electrical conductivity of the solar atmosphere and abandoned what might have been a fruitful inquiry; at the very outset he concluded that "it may be said that if the sun and stars had no magnetic fields, electromagnetic phenomena would be of little importance to cosmic physics" (Cosmical Electrodynamics, Oxford, 1950, p. 2). Such denials and avoidances of electrical physics by astrophysicists may not actually give evidence, as Velikovsky once charged, of a "reluctance . . . in danger of becoming a dogma, called upon to protect existing teachings in celestial mechanics" (Harper's Magazine, June, 1951), but at the very least they do reveal, to my way of thinking, almost total conditioning by the preconception of stellar self-sufficiency. These eminent scientists tacitly assume that the physical isolation of the sun is practically total— that the solar environment is a vast emptiness where traffic in energy is limited to subtle exchanges of gravitational forces and radiation between stars. As I pointed out in my Pensée article, the conclusion they take for granted is untenable if space, instead of being the passive emptiness they assume it to be, is itself under electrical strain and unable to receive the excess charges that the sun and the other stars might otherwise cast off. Half a century ago another factor may have forestalled consideration of electricity in cosmic affairs. At that time, a growing body of evidence seemed to indicate that electricity could not flow through a vacuum. The limitation was later shown to be due to space-charge effects—the repulsive forces of free charges already occupying the space in which experimenters sought to make currents flow. But by that time astrophysics was irrevocably committed to the theory of stellar self-sufficiency and hence blinded to the beckonings of electrical science. Professor Melvin Cook (Pensée, Winter, 1973, 56) has brought the name of V. A. Bailey into this debate, and this seems an appropriate place for another look at his ideas. Bailey's suggestion that the sun carries an enormous electric charge ran afoul of the self-sufficiency dogma. The first was based on a suggestion that the known conservation laws of energy, momentum, and charge may be imperfectly true in the four-dimensional space-time universe, but perfectly true in a hypothetical five-dimensional universe. Then, according to Bailey, "there can exist streams or fluxes of electrically charged particles" from one universe to the other, and "the fluxes inside a hot star will be very different from those outside it," leading in some way to the release of unbalanced charge within the star (Nature, 186, 1960, 508 ff.). Such an hypothesis clearly transcends physics and is the sort of explanation that only a mathematician might appreciate. Alternatively, Bailey suggested that net negative charge may be left behind on the sun by a continuous emission of hypothetical positive particles, which he designated as "astrons." To explain what he supposed was a relatively constant net charge on the sun, he postulated a steady expulsion of electrons carrying off negative charge at the same rate as the astron emission but lagging to the extent that a gap of some 1028 electrostatic units of charge was never closed. Oster and Philip, of Yale University Observatory, challenged Bailey on several counts, but in the first instance with regard to the high electrical conductivity of solar material. They calculated that any delay between a hypothetical emission of positive charge and a compensating departure of negative charge by way of electron emission must always be so small as to prevent any buildup of net charge of the magnitude Bailey required (Nature, 189, 1961, 43). In reply, Bailey insisted that the case presented by Oster and Philip "at most ... can only lead to the conclusion that the hypotheses of origin [of solar charge) are untenable and that the origin of the solar charge remains to be discovered" (Nature, 189, 1961, 43). Bailey replied: "Menzel's attempt to prove that the Sun cannot carry a significant electric charge is unconvincing since it involves certain out-of-date views about the material contents of interplanetary space as well as the unproved assumption that the earthly laws of the electro-magnetic field can be safely extrapolated to bodies such as the Sun of unearthly dimensions and temperatures" (Harper's, Jan. 1964, 12). Bailey's point about the presumptuousness of projecting terrestrial laws of physics into the distant reaches of the universe may be valid enough. Still, even though only simple faith backs up such projections, without them there could be no science of astrophysics. Nor is the foundation made more substantial by removing all inhibitions and setting known (terrestrial) laws of physics aside in favor of mathematical tinkering and metaphysical speculation. Bailey's dilemma—finding evidence of electric charge on the sun, a body whose electrical conductivity and presumed electrical isolation in space seem incompatible with a buildup of charge— is most easily resolved by discarding the notion of stellar self-sufficiency. And this, as noted earlier, is where Bruce, Crew, and I part company. They are concerned with explaining the phenomena of the solar atmosphere and of stellar atmospheres in general and are content to identify the electrical-discharge effects they see there simply as due to the breakdown of local electric fields, rather akin to those giving rise to lightning on earth. I, on the other hand, seize upon Bruce's electrified galactic atmosphere as the immediate cause of electrification in the solar system. And I assume that breakdown of a field thus built between the material body of the sun and its galactic environment is responsible not only for currents that fuel the sun, but also for the complicated electrification of the planetary system, including the comets. Any further comments Professor Kruskal wishes to make will be welcome. Pensée will Publish them without response. Ed.